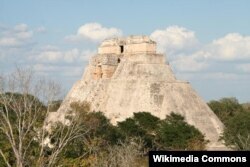 The Mayans were an ancient and long-lived civilization that flourished in parts of present-day Central America. Their civilization lasted 2,000 years, but had its cultural heyday between 300 and 900 AD in an era archaeologists call "the Classic Period." But the Mayans did things based on the heavens. Using the birthday analogy, imagine if your birthday was based not on June 6 for instance, but instead on the location of Venus in the sky on the day you were born. In order to plan your party, you'd have to know when the planet would be back in your exact birthday position. That requires some really precise math that the Mayans did and recorded in the codex. The book is a comparison of past sighting and future predictions: "historical records rather than numerology," according to Aldana. Let’s be thankful they showed their work.